How much do you know about water around the world? Find out why we need to conserve water and how you can help! Can you guess how much water goes into your food? 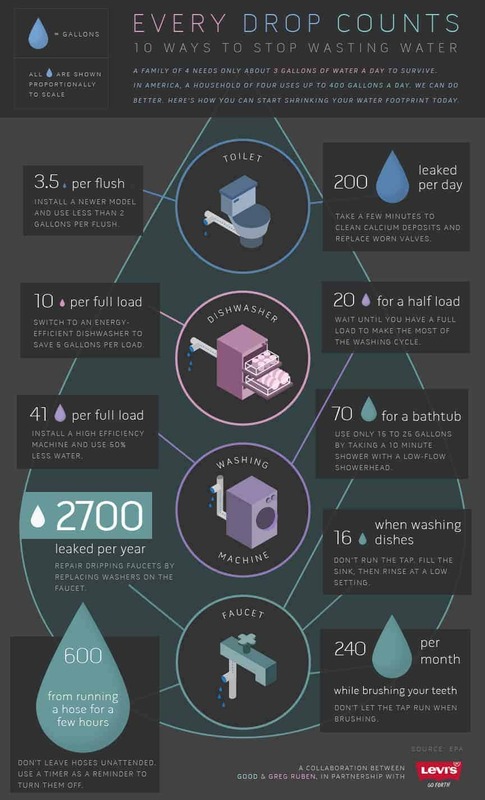 Find out 10 ways to stop wasting water – this is a great infographic! Learn how a billboard can make drinking water out of thin air! The earth is getting warmer and so more water is evaporating into the air. It has made the atmosphere 4% wetter. This means more rains, more storms and more unusual weather events like flooding. How do we conserve our water and maintain a good quality water supply? Australia is one of the driest continents in the world. With our ‘boom and bust’ cycle of drought and flood, it is important to conserve water for the dry times and maintain the places water is naturally caught (called ‘catchments’) to ensure our water supplies are clean and healthy. Water is a finite resource – we use the same water that was used by the dinosaurs – it constantly moves around the water cycle. If we pollute our water supplies, there is less clean water to go around for a growing global population. Do you know how much rain falls where you live or go to school? If you don’t already have a rain gauge in your school or home, it’s easy to make your own and keep track of your rain. Did you know that a lot of water goes into growing, making and delivering everyday things like our food? Use this website to calculate your water footprint. Check out this great infographic about the hidden water in our lives. In many countries around the world, there are people without easy access to plenty of clean, safe water. This means that often children have to help collect water for their families from wells and other water sources far away, just to have enough for cooking and drinking. This problem could become worse as some parts of the world get less and less rainfall. Watch this video to find out more about the global water crisis. Play one of these games to find out more about the issues people face when clean water isn’t available. Lack of clean water isn’t the only problem though. As the climate changes and ice sheets melt in Greenland and Antarctica, sea levels around the world start to rise – which means that people living in low-lying countries experience more flooding, farmland becomes less productive and fresh water supplies are reduced. You can’t drink salt water! Eventually as water levels rise, people may have to leave their homes. This is already happening in places like The Maldives. Find out more about the effects of climate change. Can you think of the ways we can all conserve water?